Antwerp’s efficient public transport system consists of buses and trams. 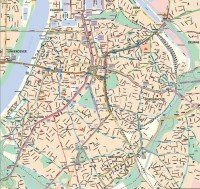 Up-to-date network maps (pdf) can be found on the website of the local transport company, delijn (Click the map). Maps of bus routes to nearby towns in the region can be found on the same page. For an alternative to buses and trams, cycling is a popular way of getting around Antwerp, especially among the locals, young and old. Cycling here is safer and more fun than in most cities. There are plenty of places to rent bikes as well as a public scheme (Velo) for short rides across town. Your hotel may also offer bicycles to guests. Antwerp is a pedestrian friendly city too.